If you've ever wanted to visit South America, today would probably be a very good day to check the airfare prices. There seems to be a few unusually good prices to some South American destinations from Toronto today, on a variety of airlines (mainly involving Air Canada, LAN, and Aeromexico). It can tough to decide between Peru and Chile, but I may have to give the nod to Chile. 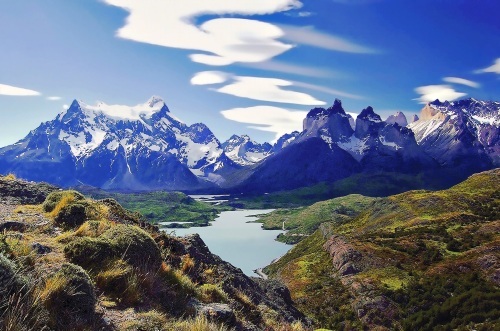 Chile rarely goes on sale (usually $1200+ from Toronto), and there's many great months to visit. November & December for the Patagonia area (summer in the southern hemisphere). And late September to mid November for Santiago (spring time). All of which fall in line with the months available for this deal. 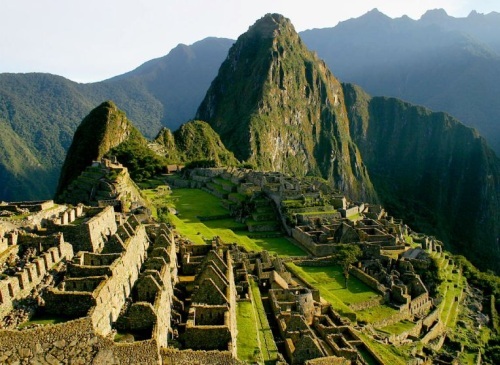 If you go with Peru, you may wish to focus on September or October. It's not as much fun to climb Machu Picchu in November & December when the rainy season begins. Alternatively, you can fly into Lima (LIM) and out of Cusco (CUZ) for $678 to $702 including taxes. How: Search on Kayak, click through to Expedia for booking. 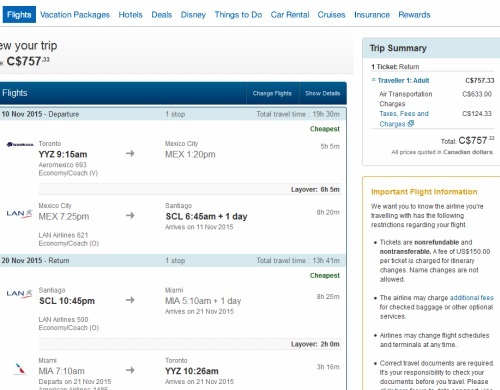 Heads up: Some flight combinations change price from $678 to $702 when you get to Expedia. Each day has numerous flight combinations, so try various ones when you get to Kayak. An amazing price to Chile, considering the typical bottom price is usually around $1200. Chile pretty much never goes on sale. Heads up: When you get to Kayak, there will be a lot of different flight choices. Some of them involve overnight stays, so watch for that. Often, there are faster flight choices for only $20-$30 more than the first one displayed. If you adjust the 'Flight Leg' slider on the left hand side of Kayak down to 15 hours, you may find some very fast flights for just $783 on certain date combinations. Other than a mistake fare in 2011, I believe this is the lowest I've ever seen Toronto - Buenos Aires go. The flights are in and out of Buenos Aires AEP city airport (as opposed to EZE, the international airport). When: Available dates seem really limited. I'm mostly finding them in late August, September, and late October 2015. 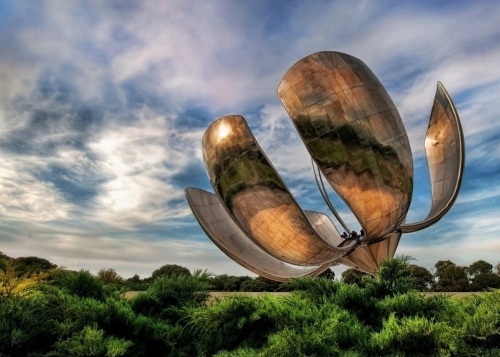 Multi-City Deal: Toronto to Santiago, Chile and then to Buenos Aires, Argentina and then back to Toronto - $853 for all 3 flights! It looks like Air Canada is now offering some amazing multi-city deals, where you can visit Argentina *and* Chile for just $855 after taxes, including the flight between Buenos Aires and Chile. I've definitely never seen anything like this before. How: search on Google Flights and click through to Air Canada to book. Heads Up: In most cases, you can either do Chile first. or Argentina first. The flights between Toronto and Chile are non-stop. Between Toronto and Argentina, they have 1 stop. (these example searches are for a 2 week trip, spending one week in Argentina and one week in Chile. It is possible to find longer trips by mixing and matching the departure/return dates from the various examples below. For example, if you modify the dates on Google Flights to Nov 05 to Nov 11 to Nov 25 it will work as well). toronto, yyz, flight deals, air canada, buenos aires, argentina, south america, santiago, chile, scl, lima, lim, aep, aeromexico and lan. 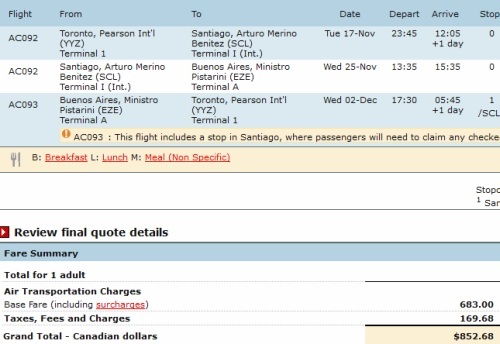 6 Responses to "South America Deals: Toronto to Peru or Chile or Argentina - $667 to $766 roundtrip including taxes"
Just booked! YYZ to LIM Aug 28-Nov 24, $665!!! Amazing price. Thank you so much. Thanks, for sharing the awesome deal. I booked to BA Argentina! I always wanted to go, and with that a really good price, I couldn't resist. No problem! I think Argentina might still be at the top of my list, as far as favorite trips go. 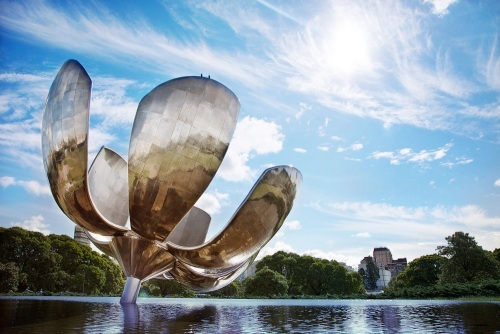 So many great things to see and do in Argentina. Big THANK YOU Chris for your awesome hard work!!! !